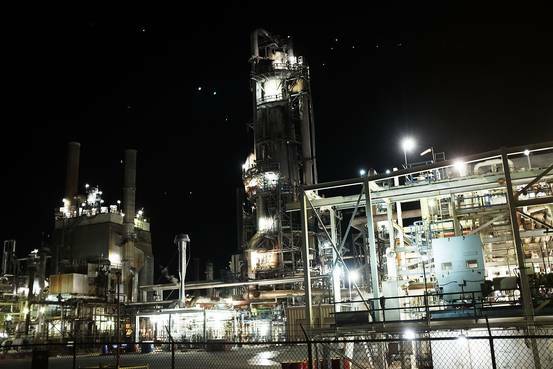 An oil refinery is lit up in the night on Jan. 19 in Big Spring, Texas. Fitch Ratings cites low commodity prices as one of the main reasons it expects the trailing 12-month U.S. junk-bond default rate to hit 4.5% at the end of 2016. U.S. stocks, commodities and corporate debt are rallying Tuesday, but ratings firms are reminding investors there are some troubling trends in the bond market: more companies have ultralow credit ratings, more bonds are trading at low dollar prices and more firms are expected to default. Corporate bonds have been in focus in recent weeks, after a major selloff hit the lower-rated junk-bond market in December. The prolonged slump in commodity prices is raising questions about how many highly indebted oil and gas producers can stay in business, and whether those concerns will make investors more jittery about buying bonds from low-rated companies overall. Big moves in the bond market have presaged shifts in stocks in the past. But if there’s a silver lining to the ratings-firm commentary on Tuesday, it’s that much of the doom and gloom stems from the energy sector, suggesting prospects are better for companies in other industries. And many of the metrics used to measure distress are still below financial-crisis levels. Here’s a breakdown of some figures making the rounds Tuesday. A tally from Moody’s Investors Service , which tracks how many companies have “probability-of-default” ratings of B3 with a negative outlook or lower, hit 248 firms as of Jan. 1, which the ratings firm says is the highest in six years. The reading is 36% higher than the previous year. A B3 rating is considered junk territory, and is six notches below the lowest investment-grade rating. Much of the increase came from oil and natural gas companies, which makes up the biggest of roughly two dozen sectors on the list, Moody’s says. Of the 174 companies that were added last year, more than a third were oil and gas firms. As it stands now, about 25% of companies on the list are oil and gas firms, more than the 9% historical average for this sector. Aside from energy firms, retailers like Bon-Ton Stores Inc. and Charming Charlie LLC were also recently put on the list. But despite the additions, the list remains 43 companies shy of its all-time high during the financial crisis. A distress ratio calculated by Standard & Poor’s, which measures the amount of junk debt trading with very high yields relative to the broader market, increased to 29.6% as of Jan. 15. The last time the ratio was higher was in July 2009, when it hit 35.6%, according to S&P. S&P also attributes the spike to oil and gas firms, which accounted for 156 of the 524 bonds considered to be trading at distressed levels. The metals-and-mining sector, which has also been hit hard by the commodities slump, came in second with 65. Fitch Ratings expects the trailing 12-month U.S. junk-bond default rate to hit 4.5% at the end of 2016, up from 3.4% at the end of 2015, which was the highest rate since 2009. In all, 74 issuers defaulted on $48 billion worth of bonds in 2015, Fitch said. “The higher rate is anticipated primarily from continuing fallout from low commodity prices challenging the energy and metals/mining sectors and company-specific issues bleeding into other sectors,” Fitch said in a report Tuesday. Still, there is some good news: last year’s rate and this year’s forecast are well below the 13.7% rate hit during the financial crisis.